Optimal D3® is a vitamin D3 supplement that contains 50,000 IU of cholecalciferol. Optimal D3® provides the distinct dietary requirements to manage vitamin D deficiency and help replenish your vitamin D stores. This product is intended for weekly use or as directed by a healthcare professional. It is recommended for use under medical supervision. Contains No soy, yeast, sugar, dairy, gluten, artificial colors, flavor or preservatives. Suggested Use: Adults, take (1) capsule weekly with or without food. 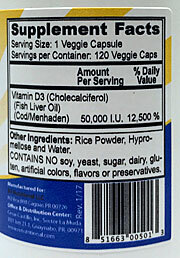 This product is a high dose Vitamin D3 capsule that is not typically for daily use. Please consult your physician for a dosing schedule. Note: If you are pregnant or nursing, consult your physician before taking this product. Do not take this product if you have had hypersensitivity reactions to any of the ingredients.